University sessions led by highly rated lecturers and visiting lecturers from our partnership schools who have all had successful teaching careers. Effective in-school support from very well-trained mentors in our partnership schools. An evidence-informed course, helping you to benefit from the latest in educational practice. Highly personalised support for you as you make your journey to becoming a qualified teacher. A holistic view of your learning, which we hope you model in your own teaching. Field trips including our popular Dorset trip to develop wider teaching skills. A direct pathway for you to a masters qualification, with your PGCE modules forming 1/3 of our Master of Research in Education. You will develop a deep understanding of the primary curriculum and acquire a range of teaching methods, based upon the latest research in education. You will benefit from a range of learning experiences, including our popular Dorset residential trip. You will consider how to make use of the world beyond your classroom door. You'll be supported in becoming a research-engaged teacher, able to use evidence to drive improvements in young people's learning and wellbeing. Your PGCE modules form part of our Master of Research in Education, which you can continue with beyond your PGCE year. 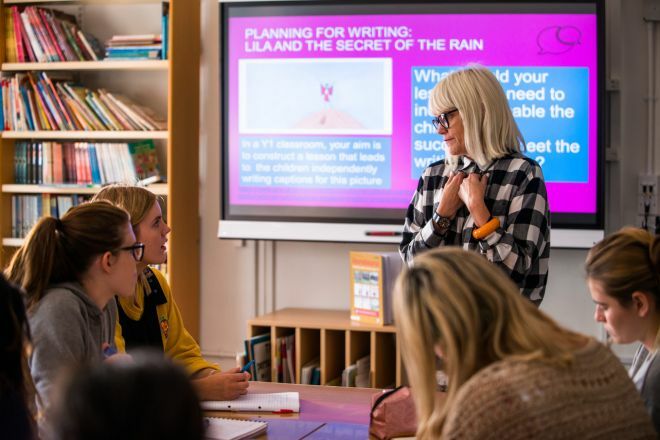 University sessions are led by highly rated lecturers and visiting lecturers from our partnership schools who have all had successful teaching careers. You will have effective in-school support from very well-trained mentors in our partnership schools.